The 2017 draft class for the New Orleans Saints, put together by general manager Mickey Loomis and assistant general manager Jeff Ireland is one deserving of more than admirable mention. 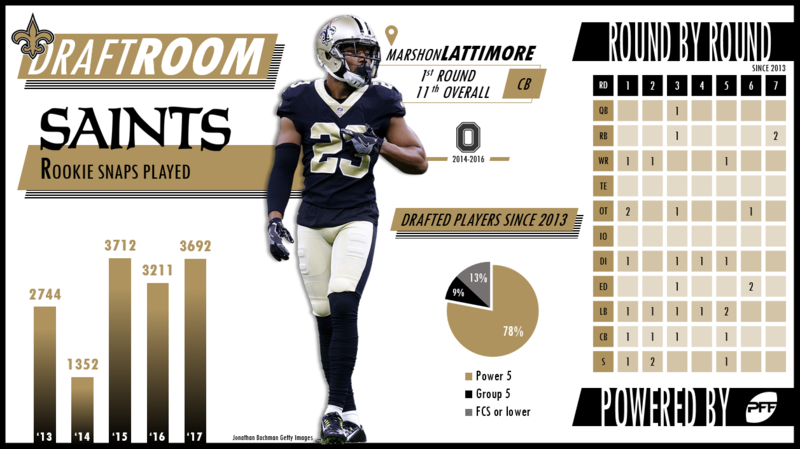 A class that showcased how one successful draft can seemingly turn around a franchise, the Saints’ 2017 draft selections featured four of PFF’s top 10 rookies – Alvin Kamara, Marshon Lattimore, Ryan Ramczyk and Marcus Williams. Classifying their roster holes as ‘musts,’ ‘needs’ and ‘wants,’ the Saints addressed ‘musts’ last year while this year may be more of the same with some ‘needs’ or even ‘wants’ sprinkled in. Head coach Sean Payton has stated they may consider selecting a longterm replacement for quarterback Drew Brees, possibly even in the first round of the front-loaded 2018 NFL Draft class at quarterback. New Orleans is without a second-round pick after trading up with the 49ers in order to select Kamara last year. A run-stopping, pass-rushing edge defender could be on the table for the Saints also in the earlier stages of the draft as the team ranked just 15th in run-defense grades last season while they finished with the ninth-ranked pass-rush unit in 2017. Adding depth to an offensive line with additional support in run-blocking could also be in order, in an attempt to pave the way for their two-headed rushing attack in Kamara and Mark Ingram. Using our Wins Above Replacement (WAR – roughly the number of wins a team gets from replacing an off-the-street player with the player of interest) metric as a model, four of the top five WAR figures generated by Saints players were done as rookies, including Michael Thomas in 2016 and Lattimore, Kamara and Williams in 2017. HOW HAVE THE SAINTS’ DRAFT CLASSES STACKED UP LEAGUE WIDE 2013-2017? One of the league’s best young receivers has been worth multiple wins above replacement since entering the league in 2016. Arguably the league’s best running back in 2017, leading the league in yards per route run and elusive rating. Was terrific as a rookie in 2017, allowing only a 45.3 passer rating into his coverage (third among cornerbacks. The blunder leading to the Minneapolis Miracle aside, Williams was solid in 2017, earning the 11th-best grade among all safeties. Earned the eighth-best grade among all tackles in his rookie season of 2017. Net a first-round pick from the Patriots after two solid seasons in New Orleans. Has never earned a PFF grade above 50.0 in three seasons. Has never earned a PFF grade above 70.0 in three seasons. PFF grades of 43.7 and 69.1 in his two seasons with the Saints. Emerged a bit in 2017 (81.0 PFF grade) after two seasons of poor grades (50.5 and 45.1). I guess our pass rush isn't as bad as everyone makes it out to be? And they did it with a substantial number of players on IR. Some of the negative thoughts are simply carry over from many, many years of us having no pass rush outside of Cam Jordan. On the other hand, yes our pass rush was pretty good this season, but we're still looking for the answer at end opposite Jordan. Yes, Okafor was pretty good, but he was second on the team with 4.5 sacks and that was tied with S Vonn Bell. Then once Okafor went down we really didn't have an answer. We had to pick up George Johnson off the couch. Hendrickson was a rookie and more of a spot player. We had to move Rankins over there. Now Okafor is coming off of a significant injury with the achilles tear. 42 total sacks on the season isn't a bad number, but we don't have the answer at end opposite of Jordan. I agree Dru we had to rely on blitzers to help that number to 42. We would be a much more sound defense if we only had to send 4 rushers to generate pressures. Now obvioulsy that wouldn't be every down, but imagine on that Minnesota Miracle if we had more pressure on Keenum he may never get that pass off. Not that it should have been a TD, but everyone makes mistakes. I know I have made tones.